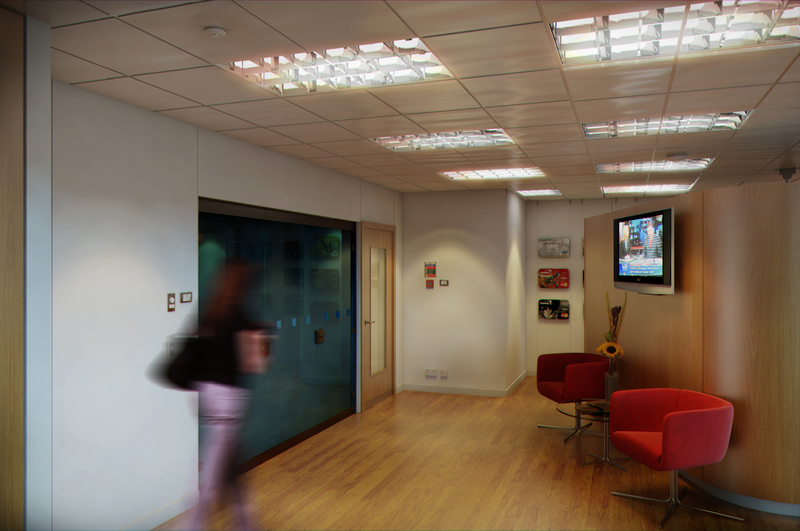 In the final part of the Achieving 3D Realism: Reception Area Render With 3D Studio Max & V-Ray Premium series, we'll continue the post-production process in Photoshop and finalize the image by adding the finishing touches and making further refinements to our render. The following tutorial is based on a real project. This unique tutorial will take users through the real process of creating shaders with bespoke physical properties and applying textures based on real photo references. The subsequent stage will introduce users to the fascinating process of creating and matching the overall lighting closely to the original photo reference supplied by the client while using state-of-the- art techniques to achieve fast and convincing results. The final step will navigate users through the intricacies of using the best post-production approaches to help enhance and finalize the 3d shot at the highest level. Most post-production effects implemented in this tutorial are kept in layers with their respective masks to achieve the ultimate control over the final results. Photoshop is very powerful and useful when addressing quick changes and/or effects that would otherwise be time consuming to address in 3Ds Max alone. 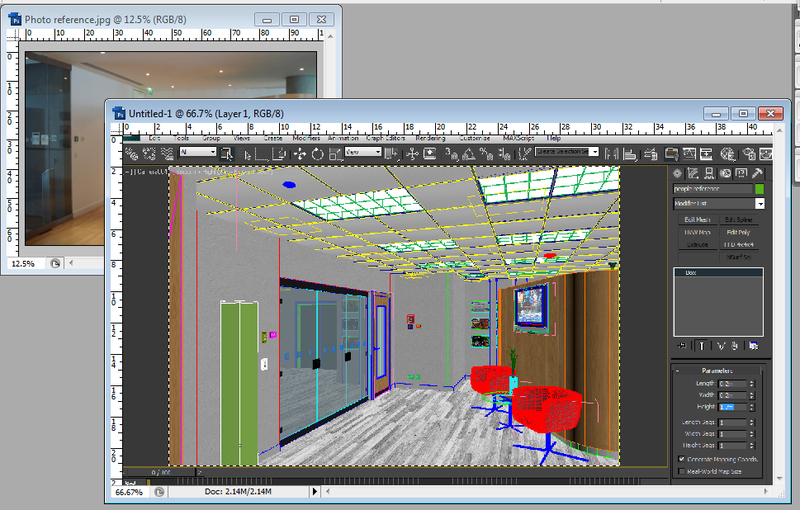 Having said that is equally important to have relatively decent renders from Max, at one’s disposal for Post-Production. This work process will ultimately prove very fruitful for one’s final piece. 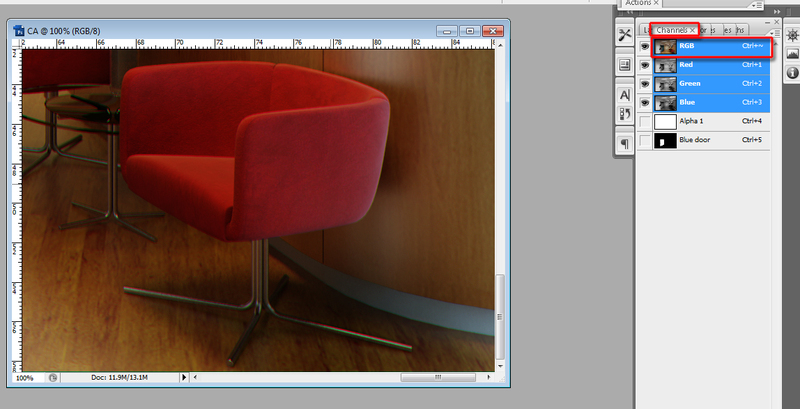 In this final part of the tutorial, we will bring in the main rendered image, along with its pre-rendered element. 103. 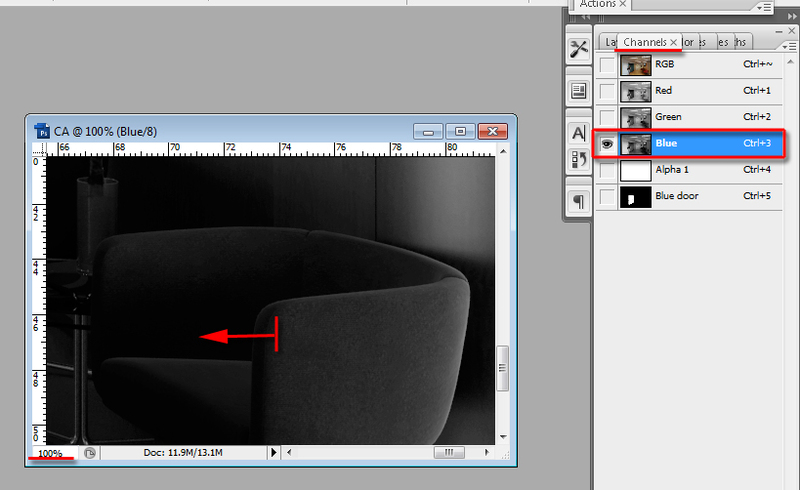 Looking at the photo reference, it seems that there’s more shadow contrast around the chair areas than there is in the rendered image. 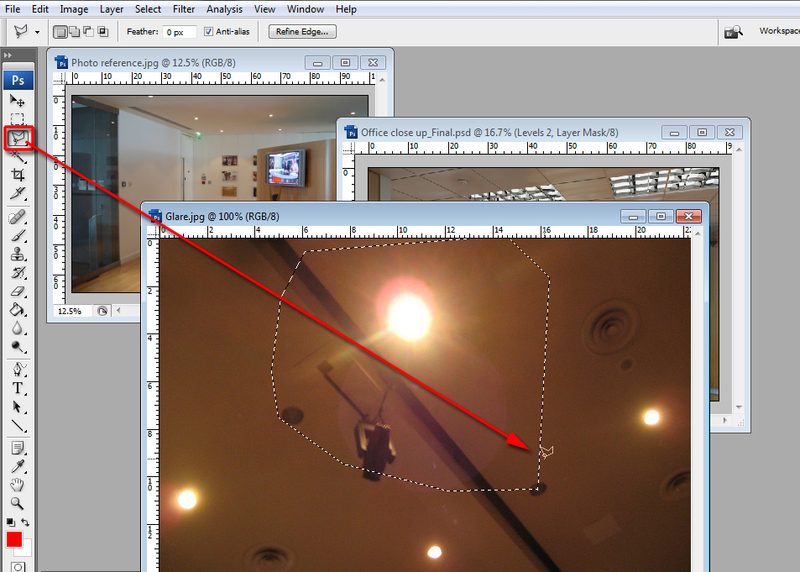 It’s probably due to the fact that the ceiling light designs of both scenes are different. 104. 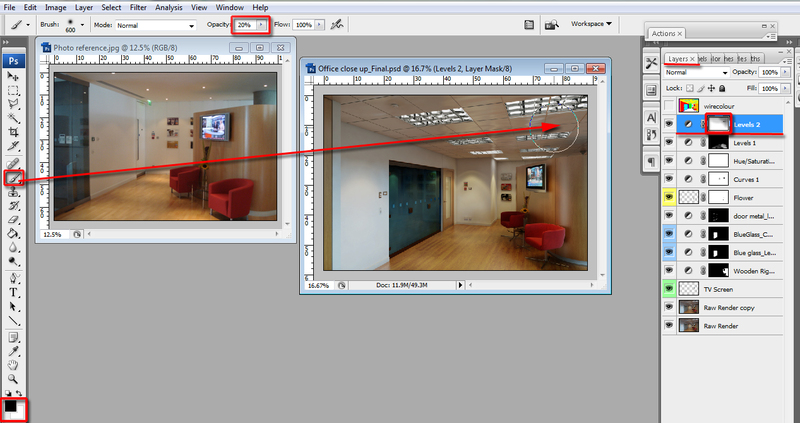 Next, select the “mask thumbnail” of the new “levels” adjustment layer. Enable the “brush” tool (b) and set its transparency to about 30% for better control of its intensity when omitting undesired areas. 105. To finalize fine-tuning the colors and the contrast of the image we are going to create one more “levels” adjustment layer. 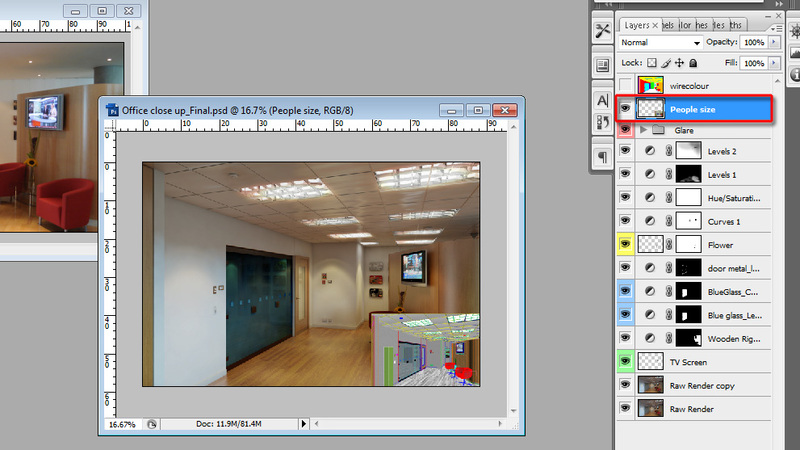 A- Once created, in the “RGB” channels, reduce the “output levels” to about 228 to darken the image slightly. B- Also, reduce the middle input levels to 0.78. C- In the “red” channel, increase the middle input level to about 1.10. 106. 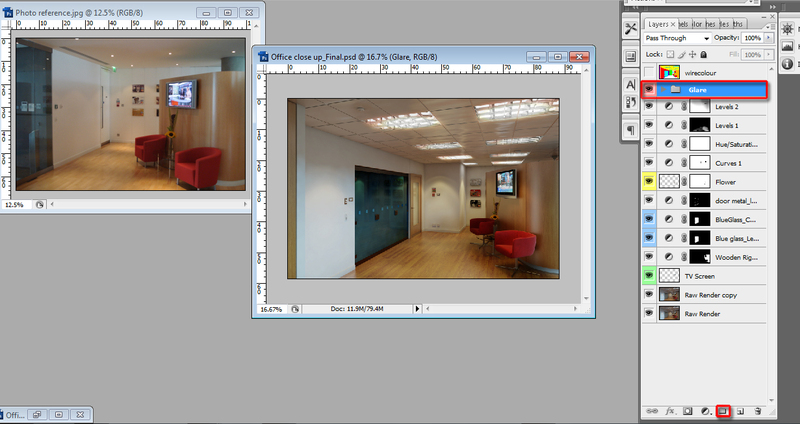 The image levels and colors are now matched closer to the photo reference. Next, we are going to slightly omit the darkness caused by this new layer on top right areas of the image. 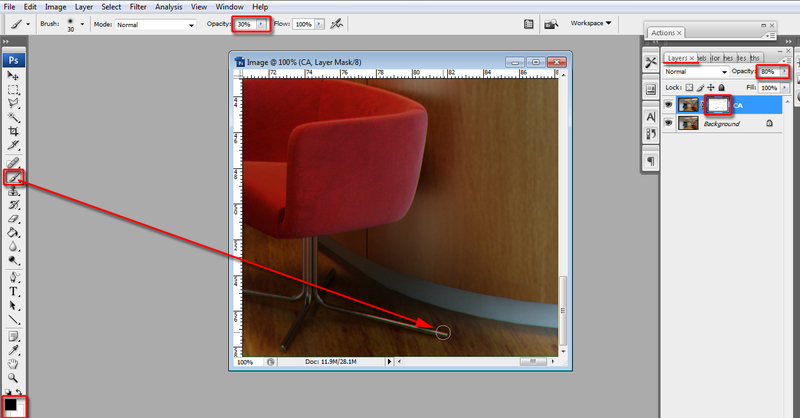 A- Enable the brush tool and set its opacity to about 20% for better control of its intensity. 107. In reality, most light sources have a slight rim color around its glow edges. To make the image even more convincing we are going to emulate this effect. A- Open a photo under the name of “glare.jpg”. This image was chosen mainly because it has the effects we are trying to emulate. 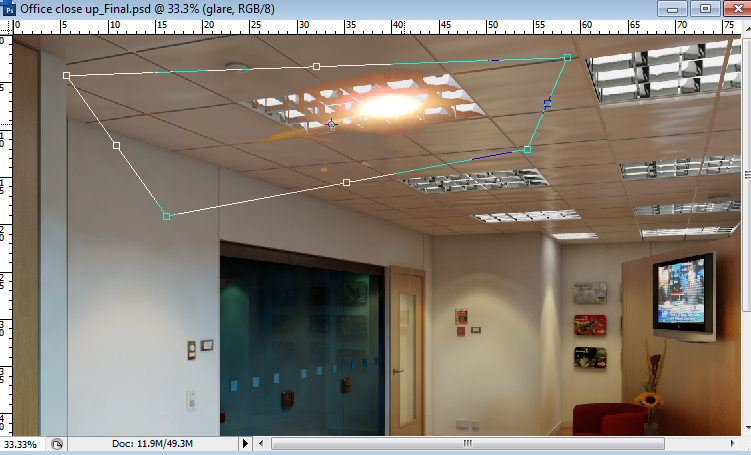 B- Next, we are going to enable the “polygonal lasso tool” (L) and draw around the desired area. 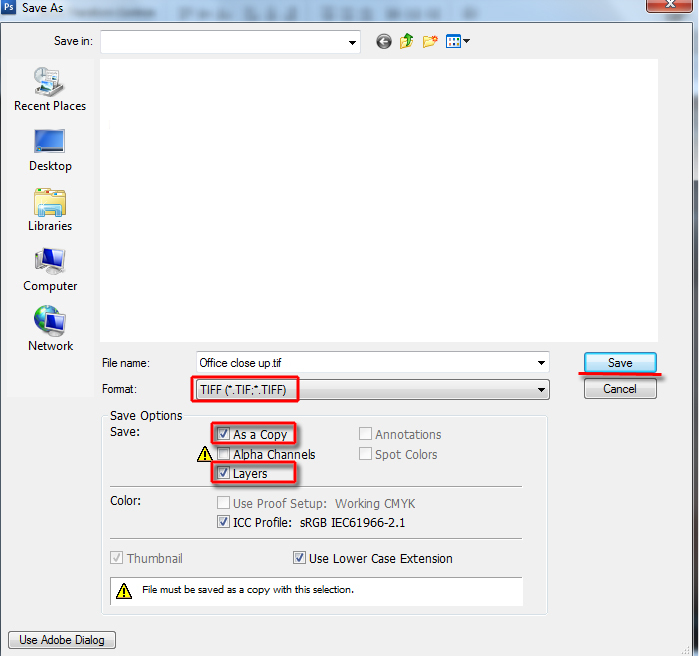 C- Copy (CTRL+C) the selected area from this document and paste it onto the “office close up_final” document. 108. 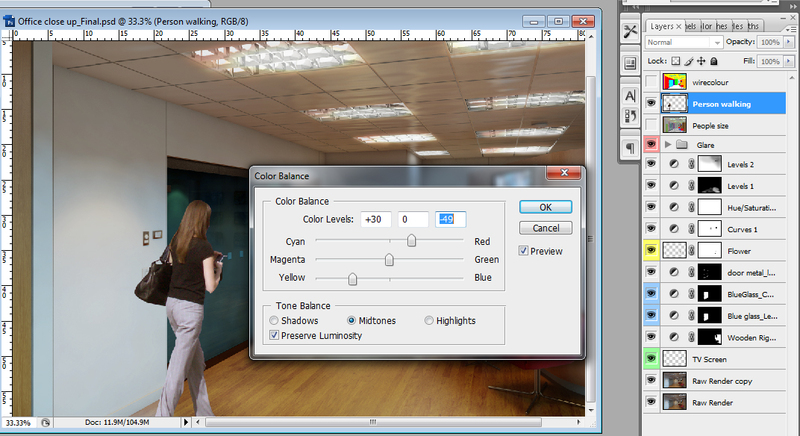 Change its layer blending mode to “lighter color”. This blending mode worked best. 109. 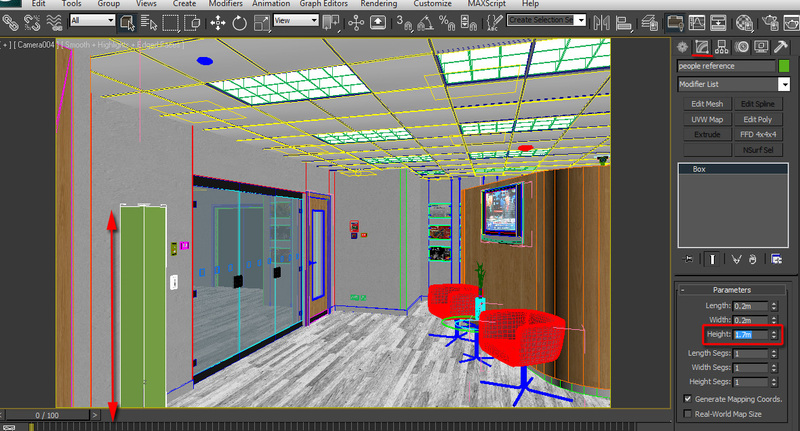 Next, we are going to tweak with its scale and opacity to fit each light model. 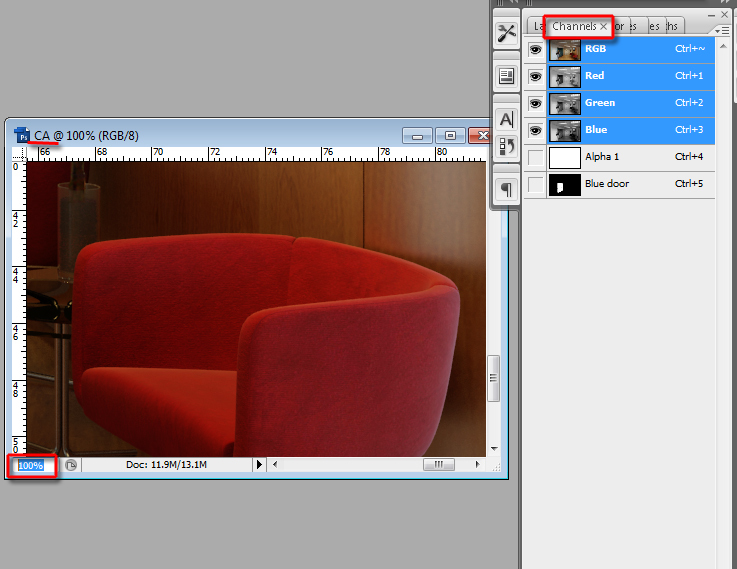 A- While the “glare” layer is selected, edit transform it by pressing CTRL+T. B- To distort it, simply right click and choose the “distort” option from list. 110. 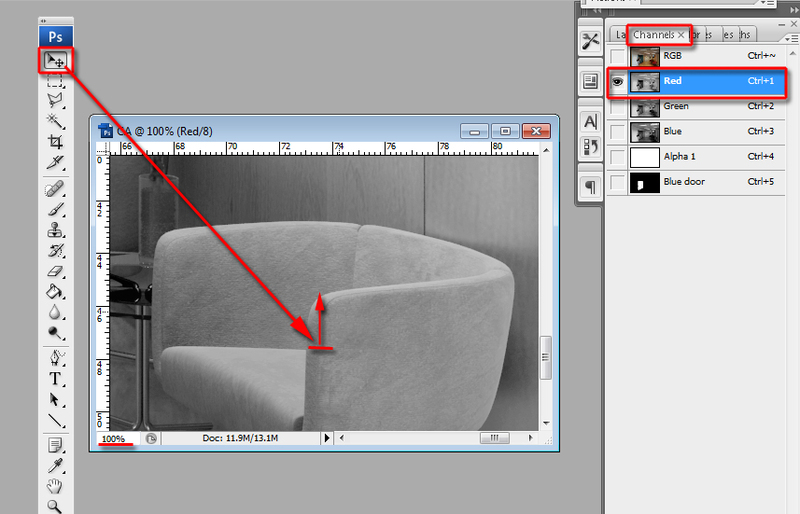 To feather and partially omit its edges, add a “layer mask thumbnail” to the layer. 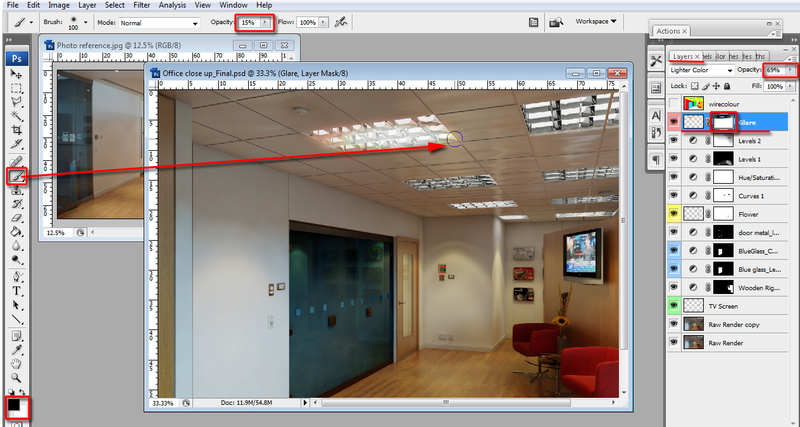 Enable the brush tool and set its opacity to about 15%. 113. It is common practice for professionals to add real photos of people to their images in order to make it more convincing. 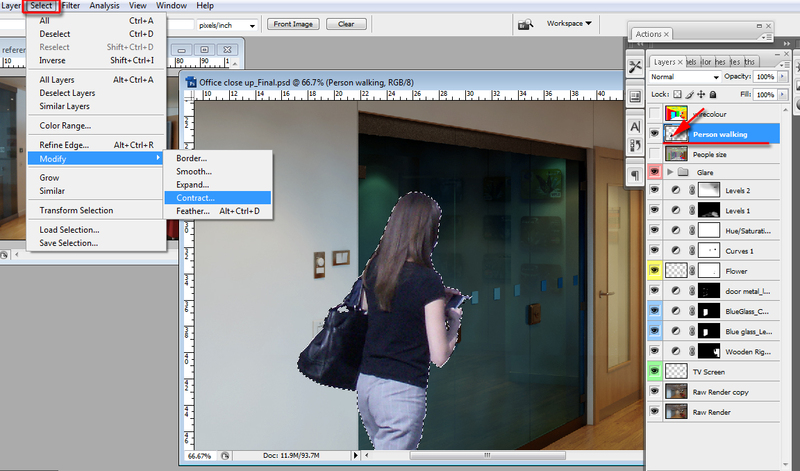 People cut-outs are often added to give a sense scale to space or to simply show the design/space being used. 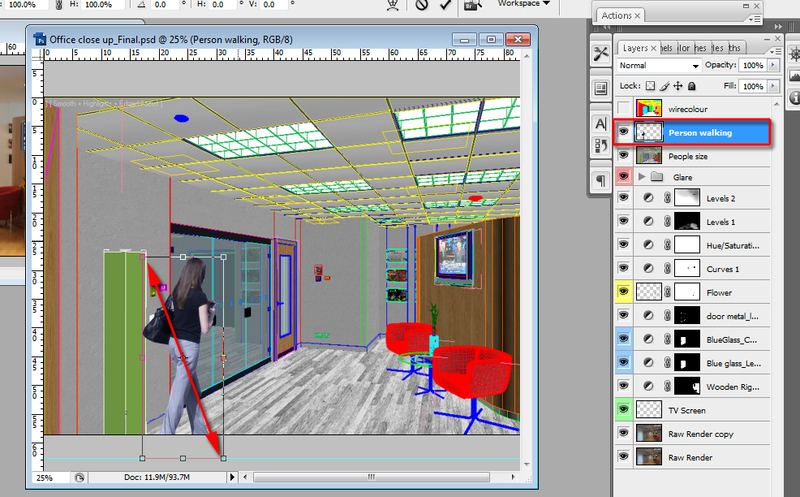 A- Prior to adding people/person in post, a box primitive is usually created in 3Ds max, to be later used as a reference for height in post (1.7m from the floor upwards). 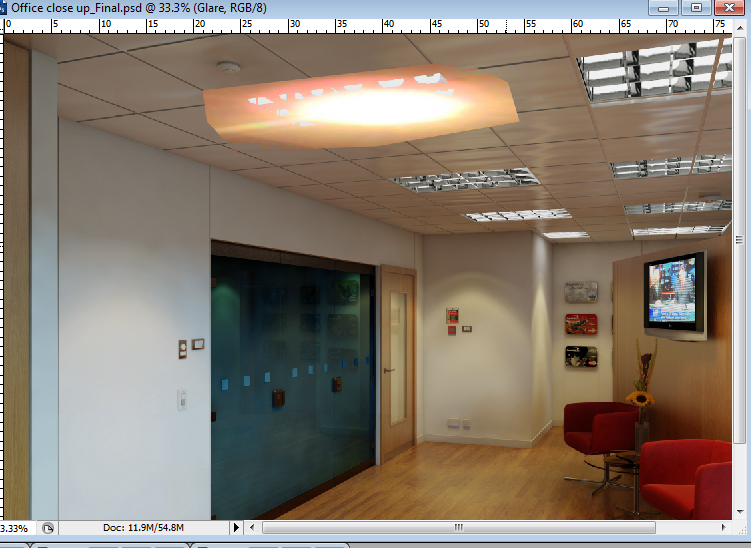 B- A screen grab is then taken from the 3Ds Max scene and pasted into Photoshop (i.e. 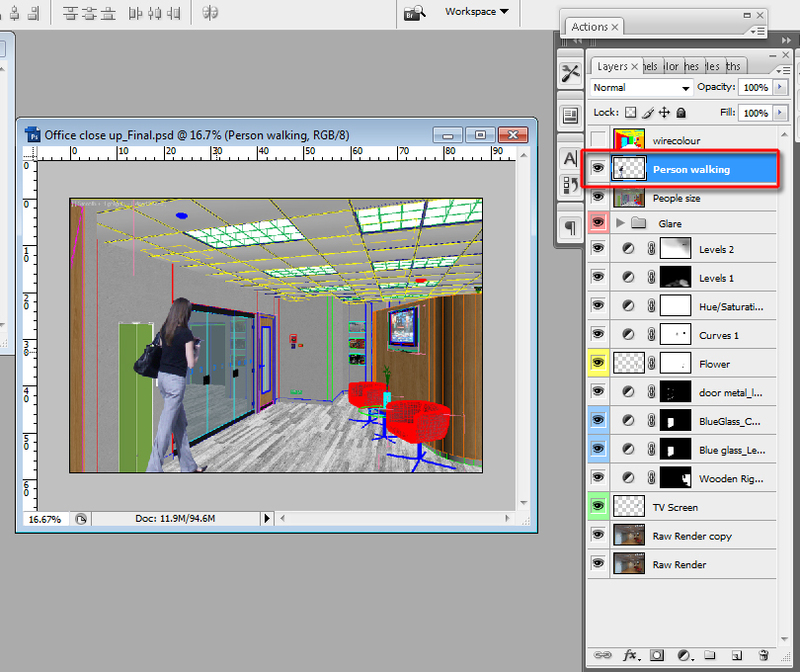 3Ds Max>prtsc >Photoshop> CTRL+N > CTRL+V). 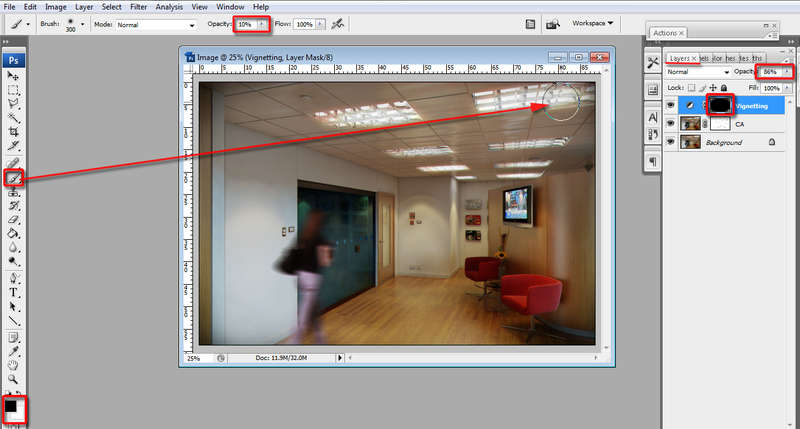 C- In Photoshop, select the camera view boundaries of the screen grab. Copy and paste it onto the relevant document. 114. 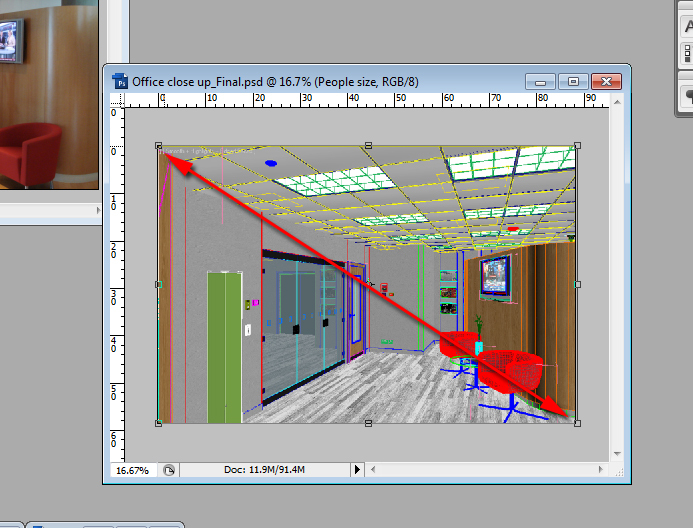 Next, we are going to scale it to match the proportions of the main document. A- To begin transforming the layer, press the “CTRL+T”. B- To scale the layer proportionally, simply hold down the shift key. 115. With height reference set, it is now time to add a person in the scene. A- Open the photo of a person walking. This photo was chosen because it adds a sense of motion; it is at the correct angle and also because the shadows/lighting look correct for the scene. B- Select the relevant parts of the photo. 117. Next we are going to cut out the tiny white edges of this layer. 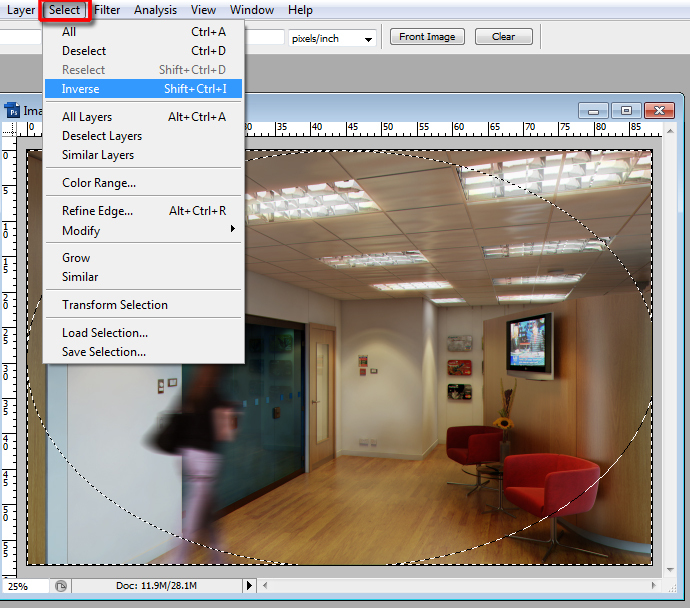 A- Hold down the “CTRL” key and click on the layer to create a selection around it. B- Contract the selection by clicking on the “select” tool from the main toolbar. C- On the dropdown list, choose “modify” and “contract”. 118. 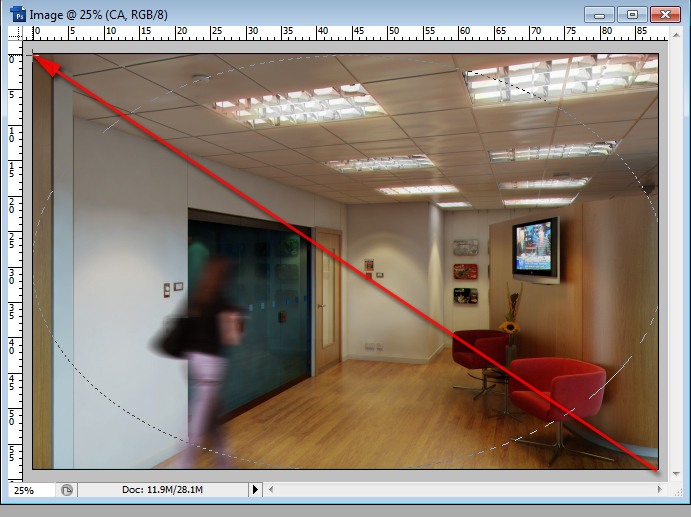 The following step is to color correct this layer to match the rest of the image and motion blur it. 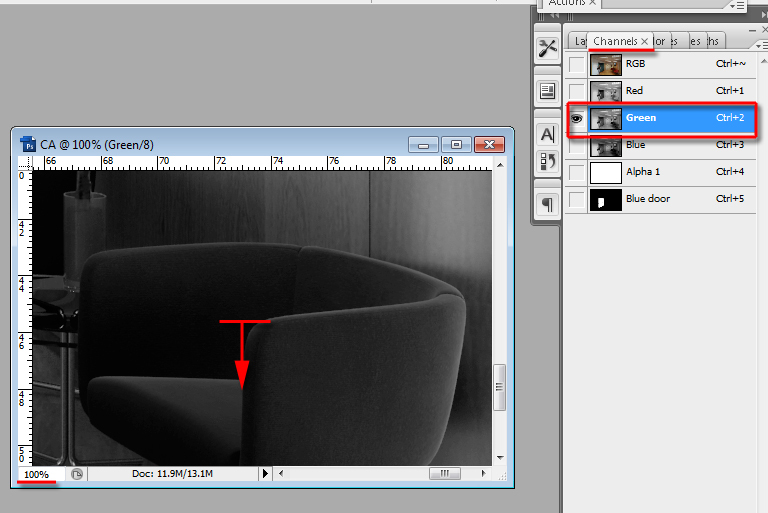 Some users would simply move this layer under the other adjustment layers in order to color correct it. It probably wouldn’t match as accurately because the original photo has a different lighting. 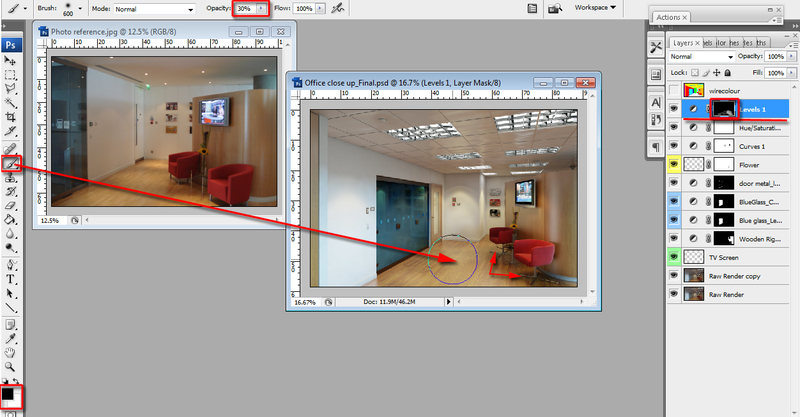 Also, most users would use adjustment layers as previously done to match it. But since this layer will be later blurred, it makes sense NOT to do it. For this reason we are going to color correct it individually. 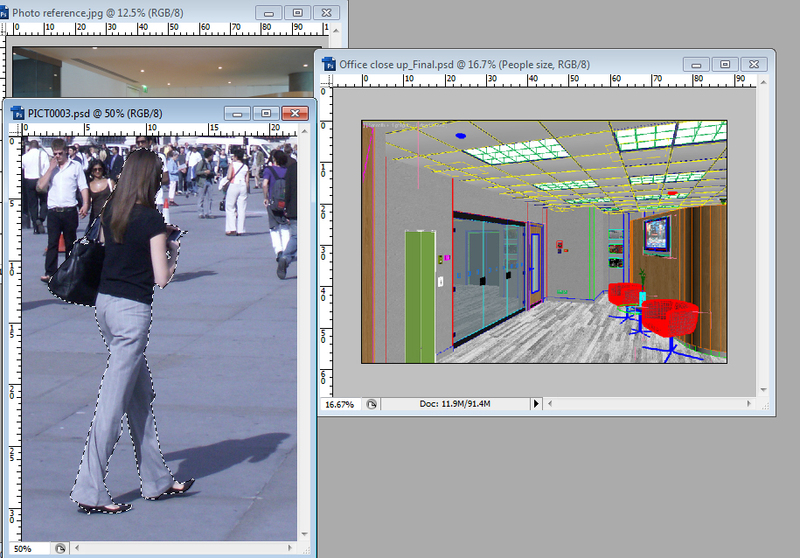 A- While the “person walking” layer is still selected, add the “color balance” image adjustment (CTRL+B) to it. 120. The layer is now blending quite well with the rest of the image. 121. 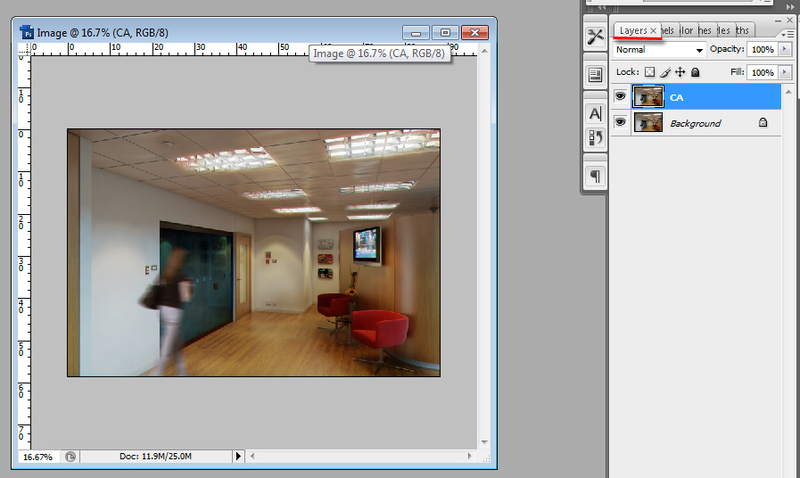 Duplicate the layer prior to adding the “motion blur” filter. 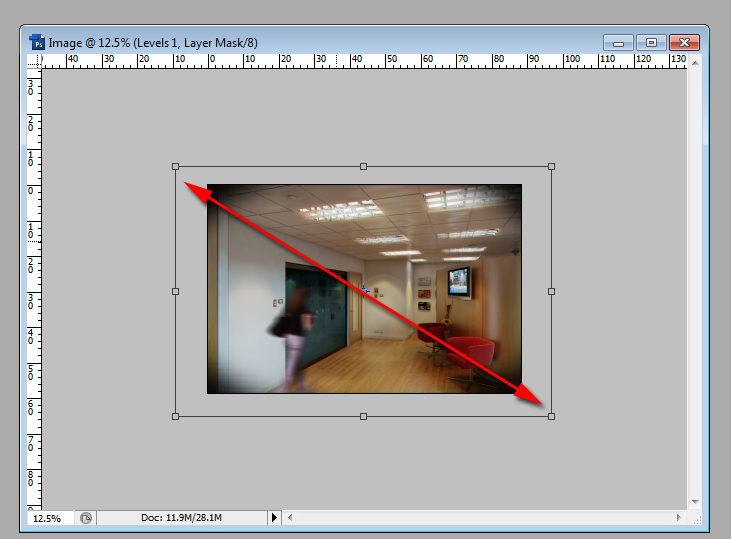 Since the “motion blur” filter is not an adjustment layer, professionals often duplicate the main layer in case there’s a need to reverse back to the original layer, at a later stage. 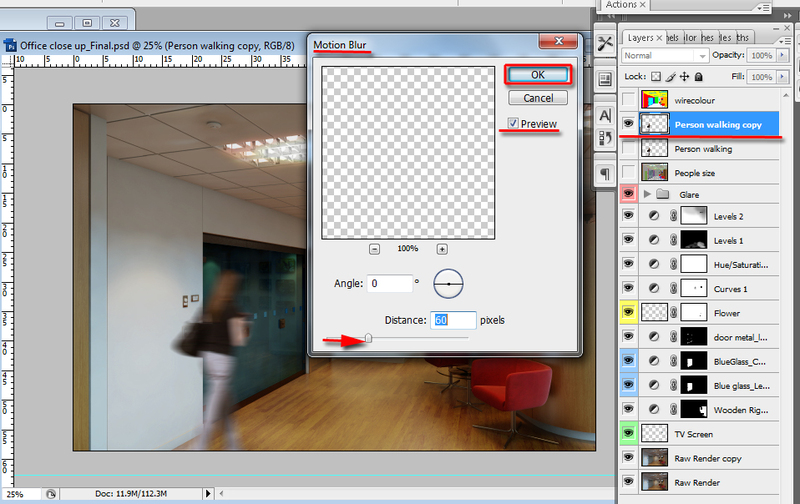 A- Click on the “filter” main toolbar and choose the “motion blur” filter from the dropdown list. 122. Next, we are going to apply the “chromatic aberration” effect to make the image more realistic and “photo like”. While this effect will enhance the quality of one’s image, it can only be fully appreciated when used with subtlety. This effect can only be applied on flattened documents. For this reason, we need to duplicate and flatten the original document. A- To duplicate the document, simply select and right click on the top most part of the document. B- Choose to “duplicate” on the pop up menu. C- Name this new document as “ca” (chromatic aberration). D- Select on any of the layers. Right click and choose the “flatten” option. 123. We now need to have two different flattened documents to tweak with “chromatic aberration” visibility. A- Duplicate this new flattened document and name it “image”. We should now have two separate flattened documents. B- Select the “ca” document and zoom in at 100 %( type in 100% at the bottom left part of the document). This is to ensure that when moving/nudging the document channels, only one pixel is nudged. 124. Next, enable the “move” tool (v). 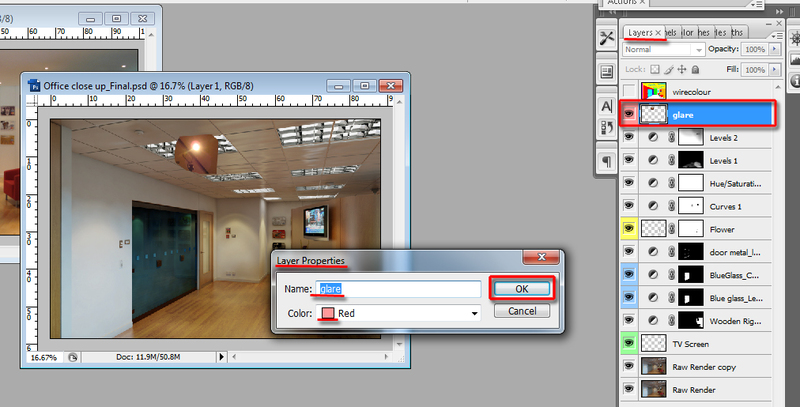 Select the “red” channel and nudge it up once only, with the arrow “up” key. Select the “green” channel and nudge it down once only, with the arrow “down” key. 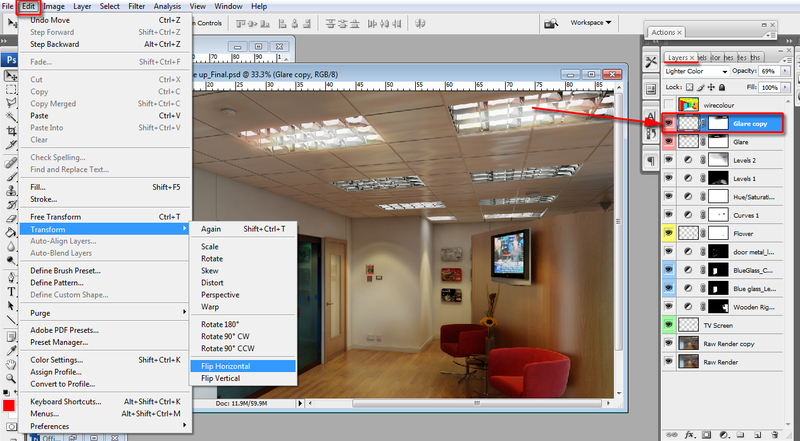 Now Select the “blue” channel and nudge it to the left once only, with arrow “left” key. Finally, select the “RGB” channel at the top, to switch back to the color mode. The chromatic aberration effect has now been created. 125. The chromatic aberration effect is currently very prominent. The next step is to try to make it more subtle and more appealing. 126. To begin reducing the prominence of the “ca” layer we are going to decrease its layer opacity first and create a layer mask. Reduce its opacity to about 80%. Next, Enable the brush tool and set it to about 30%. 127. 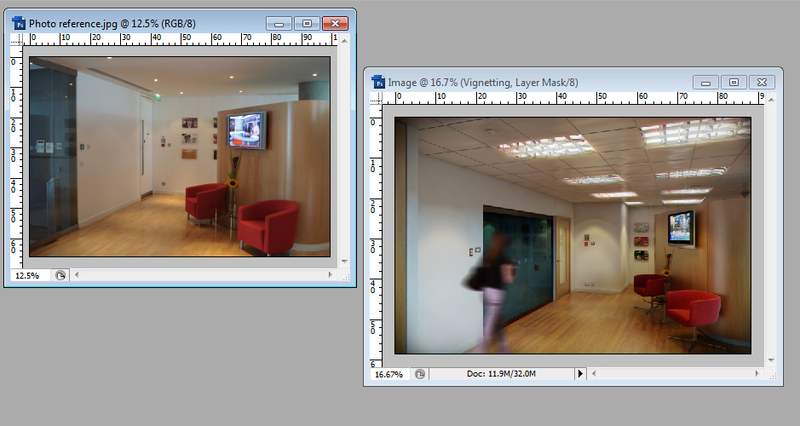 To finalize this process, we are going to add a bit of vignetting effect to make the image more appealing. 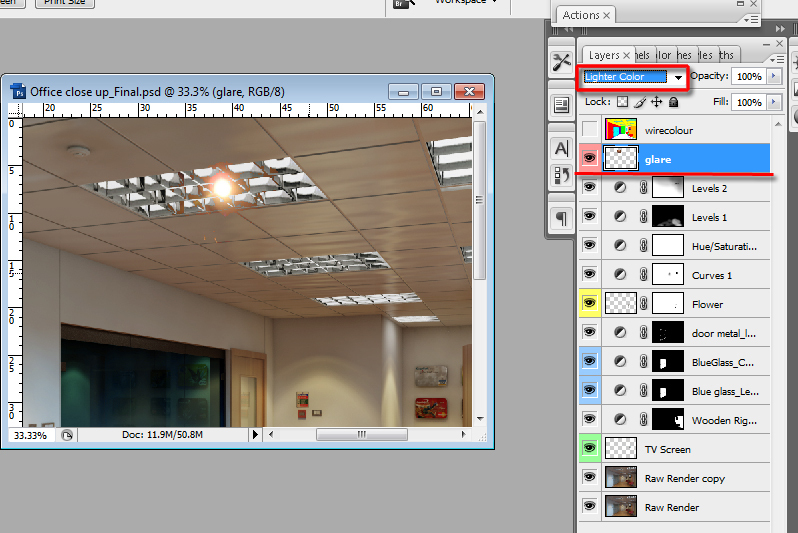 This effect will be used as an adjustment layer for the ultimate control to edit and/or turn it off when necessary. A- Enable the “elliptical marquee tool” tool from the side toolbar. 130. Next, we are going to name this layer as “vignetting” and scale it proportionally (CTRL+T) so it affects the corner of the documents only.